Raising a Super Dog - moved to rasuperdog.com: Would we call it a Teddy Duck? What do dogs dream about anyway? With legs twitching and those muffled little barks that come out as squeaks, there's something rather exciting happening in that noggin. The cat is off limits in the real world, but in your dreams . . . well, the imagination's the limit. Chase that little bugger as far as you want, kiddo. 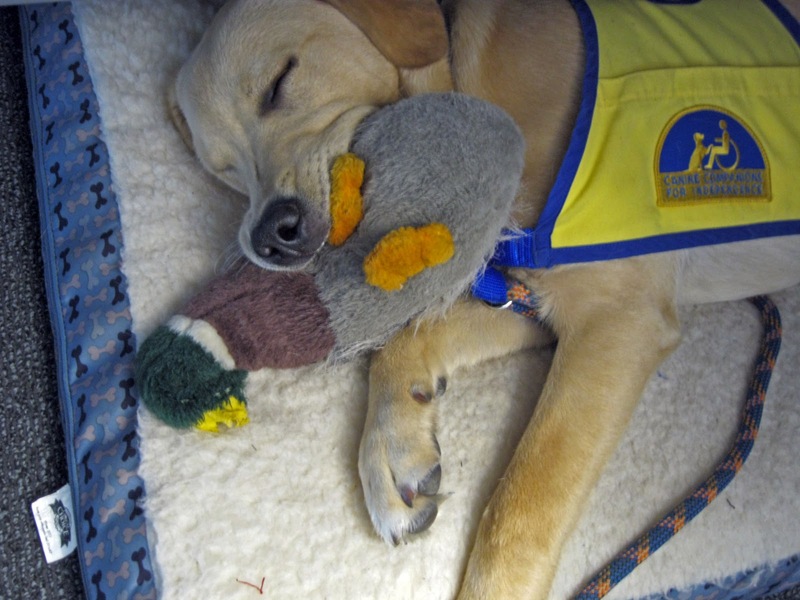 Or maybe, if you fell asleep with a stuffed duck in your mouth, you might be looking about your dreamworld for a water bowl to help with a serious case of cotton mouth. A not-before-published photo of Yaxley from June 2011. Still a young fella sleeping with his, um. . .what would we call that, a Teddy Duck? Sadly, the duck later met his fate with the Mighty Micron, who eviscerated the thing. I love it when he tries to bark with his mouth closed, it sounds like merf, merf. He's not permitted to bark in the office, but in his dreams he's giving someone a good talking to.